The bank’s full-year results for 2015 follow its admission last month that it was on track to report its eighth consecutive year of losses because of a £2.5bn hit to profits for a string of problems, including having to pay compensation for payment protection insurance mis-selling. Shares in the bank, 73%-owned by the taxpayer, slumped 10% in early trading after the figures were announced. McEwan – who has received the highest pay for a chief executive of the bank since the bailout – said further problems lay ahead for the bank, particularly from “big conduct” issues. Among these is a penalty, yet to be determined and which could run to billions of pounds, for the way it sold US mortgage bonds in the run-up to the 2008 banking crisis. The results – which followed a £3.5bn loss a year ago – mean that the bank has incurred more than £50bn of losses since 2008, when £45bn of taxpayer funds was used to prevent it from collapsing. The performance of the bank was accompanied by disclosures about pay. It said 121 of its staff received more than €1m (£800,000) during the year while its former chief executive Stephen Hester, who was forced out in 2013, received £2.1m from bonus schemes that dated to his time at the bank. Lloyds Banking Group has handed its chief executive an £8.5m pay deal and ignited its share price by announcing a special dividend – despite reporting a 7% fall in profits. António Horta-Osório’s pay was disclosed alongside 2015 financial results showing profits had been knocked to £1.6bn by a further £4bn charge for mis-selling payment protection insurance (PPI). The bank, bailed out in 2008, has now incurred a total bill of £16bn for the long-running scandal which drove it to a fourth-quarter loss. The government has been gradually cutting back its stake, from 43% to less than 10%, but despite Thursday’s rally the shares remain below the 73.6p break even price. He was also handed shares worth £3.6m in a long-term incentive plan, which could pay out in three years’ time. His 10-strong management team were handed shares worth £17m in the same scheme. The total bonus pool was cut to £353m from £369m. 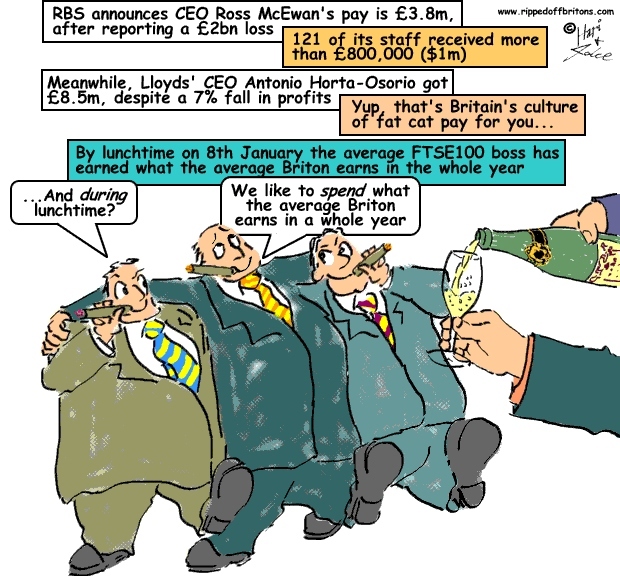 Sixty-six staff received total pay of €1m (£800,000) or more.